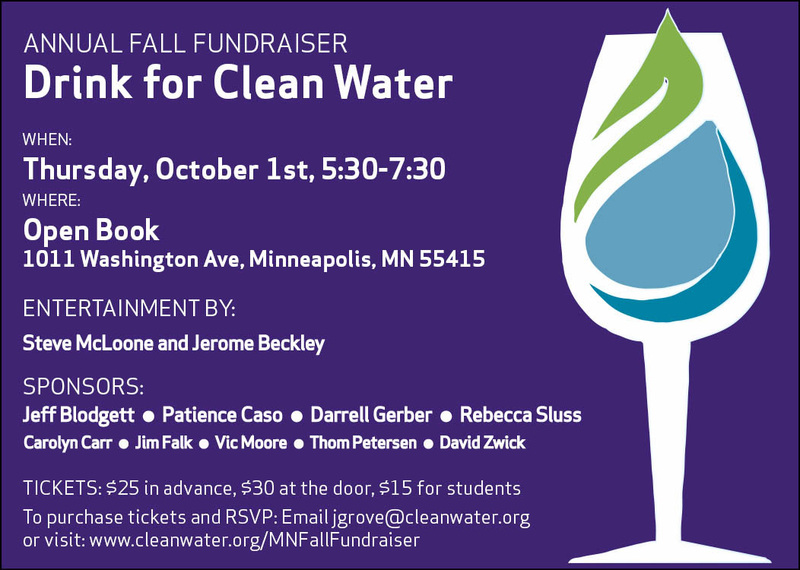 Come grab a drink with us on October 1st, from 5:30 until 7:30 p.m. Join us for an evening of celebration at our Fall event Drink for Clean Water, at the Target Performance Hall at Open Book in Minneapolis. Get your ticket today! Throughout the evening you can enjoy live music by Steve McLoone and Jerome Beckley and complimentary food and drinks with your purchase of a ticket. At 6:30, we'll present awards to two legislators and two activists who helped us fight for clean water, clean energy, and healthy communities. Reserve your spot here! There is free parking at the location, available on a first come, first serve basis. This is a fragrance free event, please refrain from using scented body products.